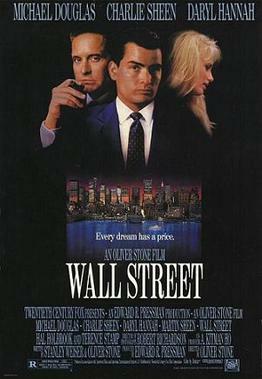 January 15, 2010 Dan O.
Enterprising stockbroker Bud Fox (Charlie Sheen) falls under the enticing spell of Gordon Gekko (Michael Douglas), an unabashedly greedy Wall Street arbitrageur. Gekko takes Fox under his wing, tutoring his charge in the unscrupulous tactics that put the corporate raider on top. But when Gekko embroils his protégé in an insider-trading scheme that may risk the jobs of kith and kin, Fox develops a conscience and decides to turn the tables. Director Oliver Stone, as many of you may know is one of my favorite directors of all-time. I like if not love a lot of his stuff so when I heard about this film, and how Douglas won a Best Oscar, I was ready for a wonderful film. Instead I got a bore-fest. This film is basically incredibly predictable in a story that goes from one place to another in cliche after cliche. The characters in this film are just basically total yuppie assholes. Even the main protagonist, Sheen, doesn’t even seem that liable to root for. He just seems so dumb and even a bigger deuche. The acting is very very sub-par. I mean in all honesty I think Douglas at times really did over-play his role as this totally unlikable guy. Some scenes hes very good, and some hes just not all that there. In all honesty he did not deserve that Oscar at all. Sheen gives an OK performance here but I found it very hard throughout the film to take him seriously since I’m a huge fan of Two and a Half Men. Consensus: The acting is OK, but the story is very very contrived, with predictable story elements, and even worse characters that your more likely to hate then cheer for.